Whilst this information is not new, I thought it would be good to cover XMPP and PIC-based capabilities available within Lync 2010, as more often than not the different modalities are misunderstood. This was the case when I attended a customer meeting this week where I discussed the benefits of Federation within Lync, this stemmed from the need for their business to ustilise voice and video with 3rd parties. We also touched on the capability to Federate with existing public social networks like MSN and Skype, the latter not being available. 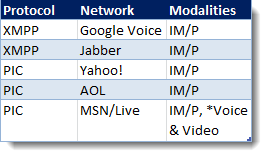 Today there are two methods of integration, Extensible Messaging and Presence Protocol or (XMPP) an Open technology used for real-time communications and/or Public IM Connectivity also known as (PIC) – dependent upon which networks you desire to communicate with (see list below). N.B. Whilst voice and video is only offered via PIC, this is not due to the limitation of the XMPP protocol. XMPP is capable of handling instant messaging, presence, multi-party chat and voice/video calling. To interface Lync with XMPP-based networks an additional component (and server, in addition to Edge) needs to be deployed, unlike PIC which can be configured directly within Lync once provisioning is completed. 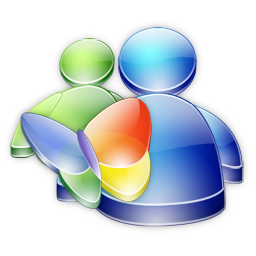 Back in December XMPP capability was announced for the MSN network via the Windows Live Blog, at this point this permits 3rd party clients to be developed – Federation is still achieved via PIC.